Syrian troops forced a crossing over the Euphrates river east of Deir ez-Zor on Monday as a part of an operation to clear the city’s outskirts from Daesh terrorists, a Sputnik correspondent and Russian military reported. “The squadrons of the Syrian government troops, strengthened by units of the fourth rank division with the support of the Russian Aerospace Forces conducted a forced crossing of the Euphrates river near Deir ez-Zor through a pontoon bridge established by engineer divisions.” the Russian Defense Ministry said in a statement. Over the course of a few hours, the Syrian storm troops have managed to drive Daesh militants out of a number of villages near the city. The correspondent noted that terrorists were resisting fiercely during the offensive. The Syrian army has destroyed several Daesh’s vehicles fitted with machine guns, killed and captivated over 10 militants. Syrian forces have been on the offensive in the area around Deir ez-Zor over recent days following the successful operation to break through Daesh forces encircling the city. On Sunday, the government forces cut off the main supply route to the areas held by terrorists near Deir ez-Zor by securing control over a strategic town located nearby. Deir ez-Zor has been under Daesh’s siege for some three years. In the beginning of September, the Syrian army finally lifted the blockade with the help of Russian aviation. The victory was a crucial step toward a complete defeat of Daesh on the Syrian territory, according to the chief of the Russian General Staff’s Main Operational Directorate. A military source said that army units crossed the eastern bank of the Euphrates River during their continuous operations against ISIS terrorists in Deir Ezzor. The source told SANA that the army units in cooperation with the allied forces, crossed the Euphrates river from the direction of al-Jafra towards Huweijet Saqr, where they are now fighting fierce battles against ISIS in the area. Earlier, army units, in cooperation with the allied forces, continued to advance on all fighting axes against ISIS terrorist organization and established control over new points on the outskirts of Deir Ezzor city and its countryside. SANA reporter in Deir Ezzor said that after the army units established control over al-Jafra village, they continued to advance and chase the remaining ISIS terrorists who fled towards Huweijet Saqr and established control over a number of points on the southeastern outskirts of the city and in the southeastern countryside on Deir Ezzor-al-Mayadin road after carrying out accurate operations, in which a number of terrorists were killed or injured, in addition to the destruction of their weapons and ammunitions. 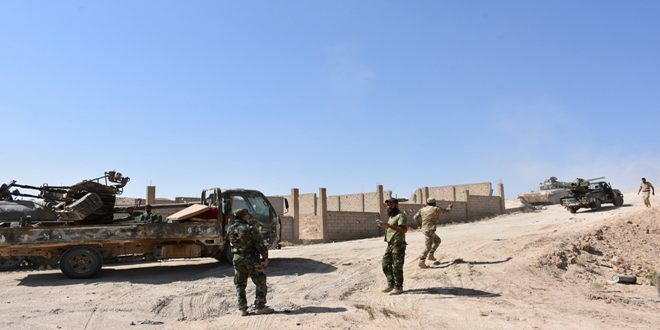 In the western countryside, the reporter said that army units advanced to the direction of Ayn al-Bo-Jimaa and al-Kharita after they restored new points amid the withdrawal of terrorists Takfiri organization towards the remaining terrorist groups in specific locations in the desert. The reporter said that the military operations resulted in the death of a number of terrorists, including Mohammad Aziz al-Hanto, Omar Jamil al-Alloum, Abdul-Hadi al-Alloum from al-Shaqra village. Meanwhile, a group of locals ambushed a car belonging to ISIS near the railway in the vicinity of the city of al-Bukamal in the far eastern countryside of the province, destroying it and leaving all the five terrorists on board dead. A military source said that the first two cargo planes landed at Deir Ezzor Airport carrying large quantities of needed materials to supply army forces operating in Deir Ezzor after the surroundings of the airport have been fully secured. TEHRAN (FNA)- The US-backed Syrian Democratic Forces managed to spread control over several regions on the Eastern bank of the Euphrates River on Monday, increasing the possibility of direct clashes with the Syrian army. The SDF continued their operations in Eastern Deir Ezzur, striking at ISIL’s positions South of the Deir Ezzur industrial zone. According to reports, SDF took control of a textile plant and a road junction known as the 7-kilometer roundabout and all factories and plants in the area. A military source reported on Sunday that the US-backed forces known as the Syrian Democratic Forces (SDF) moved further towards Deir Ezzur city and the Syrian Army troops’ defense lines, increasing the possibility of direct confrontation with the army soldiers in the region. The source said that the Island Strom Operation Room reported that the SDF were advancing towards Deir Ezzur in the battles in the province in recent days. The source added that the SDF’s advances occurred despite several cases of warning to the US-backed forces (to stay away from the army forces’ positions in Deir Ezzur). The SDF gained control over 14 farms, one village and two large towns in Deir Ezzur province in the last 8 days in order to approach the Syrian army’s positions. In the meantime, the commander of Deir Ezzur Military Council said that his forces continued their advances (towards Deir Ezzur city) from the village of Abu Faas, adding that the SDF fighters seized control over Sugar Company and Power Company near the cotton factories. Spokesman for the Russian Military in Humeimim Airbase Igor Konashenkov categorically denied claims that Russian fighter jets bombed positions of the US-backed SDF on Eastern bank of the Euphrates River in Deir Ezzur on Saturday. The SDF claimed last week that a number of its units advanced over 250 square kilometers in their anti-ISIL operations dubbed as ‘Island’s Storm’, and are approaching the contact line with the Syrian army. TEHRAN (FNA)- The Syrian Army troops have imposed control over nearly 65 percent of Deir Ezzur city as they continue to march on the remaining pockets of land still held by the ISIL on the Western bank of the Euphrates River, the Syrian Observatory for Human Rights (SOHR) reported on Monday. The Army men expanded the range of their advances on Western bank of the Euphrates River and captured the regions of Hawayej Umas’ah, Hawayeh Abu Arab, al-Khariteh (Ein Abu Jomaah), Haj Hamoud Farms, Saleh al-Hamd, Hawayej Shamiyeh and several oilfields West of Ein Abu Jomah, the SOHR reported, adding that the army has 64.3 Percent of Deir Ezzur area under its control. Field sources reported earlier today that a Saudi commander of ISIL and 29 more terrorists were killed in the Syrian Army troops’ operation in the Northwestern countryside of Deir Ezzur city. The sources confirmed that Abu Obeideh al-Najdi, a Saudi Emir of ISIL in the Northwestern countryside of Deir Ezzur city, was killed along with 29 terrorists in clashes with the army soldiers. The army is now pushing to secure the remaining towns and oilfields under ISIL’s control in the Northwestern countryside of Deir Ezzur province.